I’ve been looking for a support group I could start going to in order to work through some of my “hurts, hang-ups and habits.” I figured that finding a Celebrate Recovery group would be a good fit. I am big fan of Celebrate Recovery, purpose-driven, and Rick Warren. So I was kind of excited to find a group. There aren’t a ton of groups around here, but I found a few. One of the churches running Celebrate Recovery is a really good church that I know and is about 45 minutes away both from where I am staying this summer with family as well as where I hope to be in the fall back up in the Hartford/Manchester area. I know the pastor a little bit and the church has a great reputation so I figured it would be a good fit. As a courtesy, I contacted the pastor first. I figured it was better to talk to him in advance and explain my situation, before just showing up at a meeting. In our telephone conversation it became very clear that I would not be welcomed at their group and should look somewhere else. I have to tell you, the idea of somehow not being allowed to a Celebrate Recovery group — which by design is really for all people, whatever the issue — was pretty hurtful. Now in defense of Celebrate Recovery, I actually think Rick Warren would be pretty angry to hear about this… so I don’t blame the program. A few weeks ago, a good friend sent this to me in an email. I have re-read it a number of times since and it has been very powerful to me. I am hesitant to post it here because it may seem a bit self-serving, but I will take that risk. Read it to the end and let me know your thoughts. I pray it ministers to you as it did to me. Almost since the beginning of time, human beings have had a brutally simple way of dealing with wrong: rocks. Someone would point out the offender in the camp or the family or the clan, and everyone would come running. Picking up a cold, hard ballot of stone, they would violently cast their vote against wrong, again and again and again, until it was gone. It was their way. But one hot day in the Middle East a man stepped in front of the rock throwers and changed things forever. A woman had been caught in the act. Not hearsay, not suspicion, not circumstantial evidence. Caught in the very act of adultery. Dragging her out, the men forced her to stand in front of the crowd as they pressed in on her angrily with rocks in their hands. Clothes—if she had any on when they caught her—had been torn off. Hot tears spilled down her cheeks in shame or maybe anger. Where was the man? Was she his heart’s love or just the afternoon’s activity? There is no way to know. Either way, he wasn’t there; she was along, and they were on her. They—the self-proclaimed upholders of moral righteousness, the super pious pillars of the community armed with their bludgeoning hypocrisy and crowd-pleasing indignation over wrong. Her stomach was knotted so tightly she could scarcely breathe. Her dignity was shredded, her spirit drenched with dread, but her hands were clenched in defiance. She’d sinner and been caught, and now she was dead-ended in a circle of judges with rocks in their hands. Have you ever noticed how good it feels to throw a rock really hard? Your hand feels the weight of the stone, and when you let it fly, there’s a tremendous release. Is that what they felt that day? That each person’s rock carried the weight of the community’s judgment? It had become a familiar scene. “No,” they would yell as they threw. “Wrong! Caught! Punish!” They would throw and throw, their fury fueled by each other as much as by the crime until the one in the center was still. And then they would revel in the grim release of sin avenged. Problem is, rocks don’t hit sin. Rocks hit people. And thousands of years later, they still do. Oh, we’re too sophisticated nowadays to be flinging granite, but the words we throw in judgment and outrage are as hard and cold as any stone of old. And the release we feel when we let them go can be just as exhilarating. Four teenagers get killed on a Friday night, and we hurl our rocks: “Well, they shouldn’t have been drinking.” No, they shouldn’t have, but does that ease the guilt and the pain for their parents? A young woman gets raped leaving a party, and someone says, “She was wearing a short skirt, and she deserves exactly what she got.” We drag her into the circle and throw our rocks. A businessman goes to jail for a poor decision involving other people’s money, and we growl, “He can rot in there as far as I’m concerned.” Never mind his wife and kids, we pile the rocks as high as we can. A woman confronts someone rudely about an indiscretion in her life and later phones a friend to report, “And then I told her exactly what I thought of that sin.” Whap! Now that woman will be in no danger of appearing soft on wrong—while the woman she hit will wear the bruise. As we throw, we convince ourselves that if the rock lands in just the right spot, it can knock out something evil. You remember the story of David and Goliath. Plant the rock squarely in the forehead of your foe, and your side wins. If our goal is to kill our enemy, this could be the answer. But if we hope to change a friend’s heart, it definitely is not. We can sometimes knock sense into a person with a rock, but we can’t knock out sin. And there aren’t. Jenny was hurling those rocks at something bigger. She threw with all her might, venting years of pain, at what that house represented: sin, the blackness that overcomes hearts and makes people unrecognizable as human beings.But there aren’t enough rocks in the entire world to beat out sin. If we actually could throw a rock and hit the evil in the world, we would still run out of rocks before it was all gone. For all the wrongs that have been done to us, there simply are not enough rocks in the world to make it all right. Would there ever be enough rocks for the Holocaust survivors? Would every quarry in the state of Oklahoma yield enough stones for a man who would blow up a building, killing 168 people whose only crime was showing up for work? All the rock throwing in the universe cannot calm what aches and burns inour souls when we have been horribly wronged. We cannot set the bone of what is broken on the earth with a cast of jagged rocks. When that one man stepped out of the crowd of rock throwers that day and scribbled in the sand, he reminded a group of angry people who wanted to beat the sin out of her that it just wasn’t possible. And he wasn’t going to let them try just so they could feel better. They could kill her, but it wouldn’t solve the bigger problem. And he had come to solve the bigger problem so we couldn’t have to try with our little, pathetic rocks. No one could say anything. His words disarmed all their accusations. He cut away the false high ground from under the feet of the self-righteous and for all time leveled the playing field between accused and accusers. He gave those of us who have made the worst choices of our lives a place where it is safe to be broken without fear of being destroyed. He showed us that no matter what, he would stand between us and our judges. h the freedom to choose love over judgment. He didn’t make the accusers drop their rocks. He never does. He just challenged them to consider their own hearts, saying, in essence, “Deal with yourself before you deal with anyone else.” Because he knows how prone we are to judge others. The two things we judge most harshly are those things we don’t struggle with at all and those things we struggle with the most. If we don’t struggle with an issue, it’s easy to take a hard line and have no compassion. It isn’t our problem, so we don’t understand why it’s anyone’s problem. If we do struggle with an issue, we may be the harshest judge of all, because we condemn most vehemently in other the very things we try to deny in ourselves. Our own hearts are deceitful, and Jesus said be very, very careful before we judge, because if we judge others by the rock, others will judge us by the rock. But judge with love, and we’ll be judged with love. Most of us are used to lining up on the loveless side of judgment; we’ve been doing it for years. We’ve grown up in the rock rodeo, becoming champion throwers at our favorite sins. We can hit what we think is the bull’s-eye from a hundred yards or more. But then the day dawns that we come running with our rock, and our hand freezes at the realization that we are throwing at our own sin, and we’ll hit ourselves in the process. Or we arrive at the circle just in time to see the one forced into the center is our loved one. Or maybe one day our door is thrown open, and to our horror the circle of hate and rocks is closing in on us. Love is giving us a chance to choose. Such moments come at different times for each of us, as when that sin we found so easy to hate now has a face and eyes, maybe even our own. And what was so simple for us to judge before, now convicts us deeply or breaks our hearts. When this happens—when your son tells you he’s homosexual, your best friend confesses in agony she’s having an affair, or your sister tearfully describes her abortion—you have a choice to leave mere theory behind and enter the gritty reality of relationship. As you listen, your teeth clench, and anger erupts, and your grip on the rock tightens. You want to throw it so badly. You want to say exactly what you think of that sin and try to beat it out of them. You’ve done it a hundred times before, hitting the anonymous “sinner,” but now it’s painfully different. Love is giving you a chance to choose. Seeing our own loved one in the circle is the most poignant challenge of all, for it invites us for the first time to step between the accusers and our beloved. And we can see in the mirror of our own emotions the way we’ve shut people out by the rigid compartments and categories we’ve created. We can see how callously and carelessly we’ve treated others because their wrong never significantly touched our lives. We can see this, because it never hurt before. Not like this. And we stare at the ugly face of judgment in the mirror. We drop our rocks, and they fall to the ground with a flat thud of grace. If the adulterous woman had been someone’s beloved, the people might have dropped their rocks for her. But she wasn’t. She was an easy target for them to hit because she meant nothing to them and she was blatantly wrong. Which made it easy for the people to hide behind her sin. There was no one in the crowd without blackness in his heart, but would any one of them acknowledge that? If they could scorn her sin publicly, they would not have to think about their own. So there she stood, possibly naked, a little defiant, but mostly ashamed. She fell to her knees and closed her arms tightly around herself as she braced for the first rock. She waited in agony, afraid to hope as she stared at the dirt becoming mud with her tears. She couldn’t stop replaying the images of that morning. Door thrown open. Being forced outside and dragged through the streets. They would never let her go. She was so clearly caught. Lost in her own thoughts, she almost missed the soft little thump of a rock falling to the ground, then another and another. Then shuffling. Then stillness. Eyes downcast, she saw no feet around her, just rocks lying here and there. Still she could not lift her head. Everyone else was gone. Only he was left. For the first time since the ordeal began, she lifted her head. When we have done wrong, there is no sweeter moment in all of life than to feel the forgiveness of God. His words told her that it was all right, despite all that was wrong. The same Love that called the other to drop their rocks was also giving her a chance to choose. Continue the sickening slavery of wrong, or walk in the freedom of forgiveness. There was a fork in the road for her, too. The “go” is the grace. No matter what happened next, she would not be punished for her crime that day. He’d granted her an undeserved pardon wrapped in magnificent forgiveness. She was free to go free. The “sin no more” is the cost of staying free. Could she really sin no more? It depends on which road she chose with her freedom. Would she go back to her old life, hunting furtively through the streets for the man she’d been with? Or would she feel the powerful strength that real love and forgiveness had just given her, hold her head high, and never look back? Go and sin no more. Love appears to allow evil to run right over it. But isn’t that part of love’s glorious strategy? In the drama of this world, the play wasn’t over after act 2. At the climax of the conflict when it looked like evil and judgment would win, the plot took a surprise twist: the author stepped into the play. He revealed the hidden power of love, giving us a divine show and tell we would never forget. And that changed everything. Our rocks will never change the world, only pockmark it with hate and fear. Throwing rocks will never make us more loving. As we clutch and throw our rocks, we reveal our pettiness and our inability to change our own lives. Only when we drop our rocks and choose to love do we become more loving. So the next time someone trembles in fear and tells you something you really didn’t want to know, or you see your sin in someone else’s life, or your loved one is braced to feel your stone cold words, you’ll know what to do. Loosen your grip, and listen for the flat thud of grace as you choose love over judgment. The only one who has the right to throw a rock is the one who has never done any wrong. Ever. The only one who is without blackness in his own heart. The one who has never taken anything from anyone else, never compromised his own standards, never lied even a little to make himself look better. There has been only one, and only that one can pick up the rock. Love is still giving us the chance to choose. The story of King David’s fall is a powerful one to reflect upon. David, afterall, was a “man after God’s own heart” (1 Sam 13:14, Acts 13:22) and yet he committed adultery with Bathsheba, had Uriah murdered to cover up his sin, and ultimately destroyed his family too. (1) What you FLIRT WITH you will FALL TO! (2) What you FEED will FLOURISH! David flirted with sin. David allowed his eyes to wander and to fixate on Bathsheba. David flirted with sin and therefore eventually fell to it — and it was inevitable. This is because David fed his fantasies — and what you feed will flourish. But David is in such denial that he misses the significance of his sin altogether. That is, until he is confronted by Nathan. In 2 Samuel 12:1-9, Nathan confronts David with a story of sin and asks David what should happen to the person in the story. David misses that Nathan is actually talking about him, and declares that the person must be punished severely. At this, David is crushed and convicted (2 Samuel 12:13a) — and only then can he begin his road to recovery and restoration (2 Samuel 12:13b). (1) What I FLIRT with I WILL FALL TO! (2) What I FEED will FLOURISH — good or bad! We repent. We mourn. We pray. And we live to fight another day — all by the grace of God. David prays a powerful prayer of repentance in Psalm 51. I go to it often. I hope you do to — because I AM THE MAN, and so are you. I have been doing a ton of reading these last few weeks. When summer comes and things slow down, I love to catch up on the piles of books I don’t get to during the busyness of the year. This summer I have lots of time to read, so I am digging in. 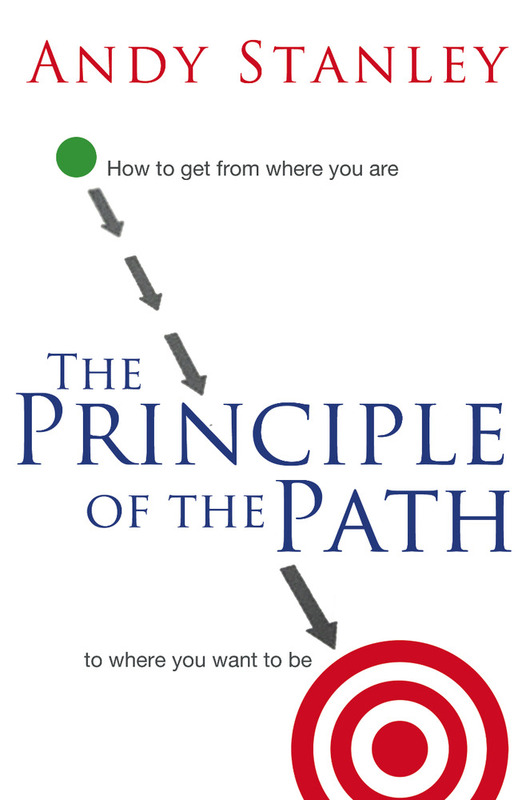 One of the best books I’ve been reading so far is Andy Stanley’s The Principle of the Path. In short, here is his thesis: DIRECTION, not INTENTION determines our DESTINATION. In other words, if you are heading north, you will end up north even if you intended to go south. In fact, intentions are pretty meaningless when it comes to our journey. All that matters is really the direction we are heading. As I have been reading his book, I am consistently finding myself saying “Ahhh… that is how I got here!” I think many of us rely on good intentions to keep us on the right path, and then are surprised when we end up in a very different place than we intended. In several areas of my life I can tell you I have ended in a place that I never wanted to be, intended to be, or dreamed I would be. And it wasn’t mystery or magic that brought here. It was the direction I was heading the whole time — like it or not, acknowledge it or not. I think Stanley is right… once you understand and internalize this basic and inviolable principle, you will be able to live life with much more success. Now, my INTENTIONS and DIRECTION are coming into ALIGNMENT. That is a really good thing. Too bad I got so far down the wrong path before I realized it. But the good news is that life is a journey and this journey ain’t done yet. Where are the Churches? One Billion Hungry! In the midst of such a crisis, the question is WHERE IS THE CHURCH? The answer: often on the frontlines! Can we do more? Yes. Must we do more? Yes. But the truth is that the local church is leading the charge in the world today against hunger, poverty, illness and illiteracy. Brennan Manning, one of my favorite authors and speakers, talks a lot about his friend Paul Sheldon and the role he has played in his life. Brennan is a recovering alcoholic, former priest, and all-around ragamuffin (his words, not mine). In a talk he gave a while back, Brennan talked about how a friend is someone who stands with you in the bad weather of life and that Paul Sheldon is that kind of friend. “Back in 1973 when I was an alcoholic, a drunken bum in the gutter for 18 months, I was in Ft Lauderdale FL… alone… on the street. Twice a month for 18 months he did that… just sitting with me, buying me some breakfast, just holding my hand — and for me, Paul Sheldon was the human face of Jesus Christ. Here’s to praying that everyone would have a Paul Sheldon in their lives! Amen.